You race along the twisted blue corridors, take one, two, three left turns. Shouldn’t that take you to the same place you started from? Not here. Without slowing down, you risk a glance over your shoulder. 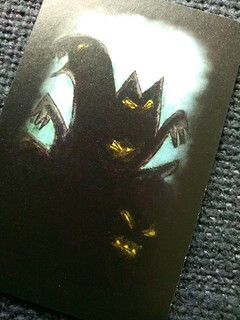 The yellow eyes of the Nigthmare are closer now, almost upon you. Then you see it, straight ahead: one of the red doors of the Observatory. You dive through and slam it shut behind you, mere seconds before the shadowy monstrosity barrels into it. It rages, but the door will hold. Ahead of you lies another maze of twisting passages, all alike. You close your eyes and break the key you found. A brief vision of the steps ahead fills your mind. You know where to find the next door, but you also know another Nightmare is waiting there for you. And that’s where you’d wake up in your typical dream. Well, either there or at the point where you realize your naked in front of your whole class. But if you are one of the Dreamwalker in Onirim, you have no such comfort as waking up – lost in the dream labyrinth, you must find the eight oneiric doors before your time runs out or stay trapped in the labyrinth forever. And there won’t even be David Bowie as the Goblin King to make eternity more entertaining. Fortunately, escaping from your basic dream labyrinth is a straightforward task, all you need is a deck of cards. Even a second player is completely optional, Onirim plays just as well solo as it does as two player coop. With those cards, you chart your way through the labyrinth. Each turn, you play one from your hand with the only restriction that it’s symbol (sun, moon or key) may not match the symbol on the previous card. When you play the third card of the same colour in a row, you may search the draw pile for one of the doors in that colour. After each card played, you draw a new one. Since doors come from that pile, you may get lucky and just draw one. If you’re holding the key, you discard it and keep the door. If you’re less fortunate – and you will be, sooner or later – you draw a Nightmare. No one likes having nightmares, so don’t expect it to be different here. Drawing a Nightmare forces you to return one door you had already discovered, discard one of the valuable key cards, discard your hand and redraw or discard five cards from the draw pile. That last one might not sound so bad at first, but when the pile runs out you lose the game and you don’t have many leftovers most of the time. When you don’t have any cards you want to play, you can also discard one and draw a new one instead. Again, the key cards are somewhat special: discarding a key lets you look at the top five cards from the draw pile, discard one of them and reorder the rest. And that is the basic game already. Discover the eight doors and you win. Frankly, the basic game is bland and the only reason you’d want to play it again is because you really, really like the dreamlike art on the cards – which is very nice, but since there are only eight different images it doesn’t improve the replay value much. What does improve the replay value are the three expansions already included with Onirim which can be added to the basic game individually or all mixed together. I’ll start with my least favourite of them and then go on to the ones I like better, because – well, basically because my language teachers always taught me that good writing should build a climax. So the first expansion is “The Towers” which adds twelve cards with more pretty illustrations – the towers, obviously – but doesn’t add all that much to the game. The Towers go to a second row of cards, next to the room cards and you must build the dream castle from four of them, one of each colour, before you can win the game. 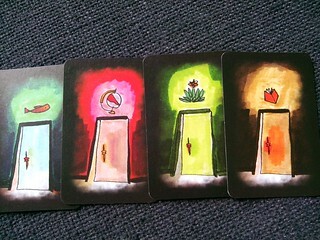 Just like room cards, the tower cards have symbols and neighbouring cards may not share the same. Nightmares now also destroy one of the towers, but once the castle is complete it’s indestructible. Any leftover tower cards can act as a weaker version of the keys and allow you to reorder three to five cards at the top of the deck. The two remaining expansions are more meaty than that and give you more reasons to replay Onirim. The first of them, Happy Dreams and Dark Premonitions, puts powerful obstacles in your way: the Dark Premonitions. These eight cards all show a condition that, when fulfilled, triggers a devastating effect. 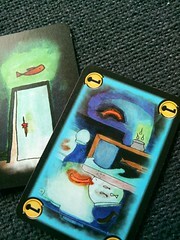 Discovering the second green door, for example, can bring an already discarded Nightmare back into the game. Others steal your key cards, make you discard your hand or even take away an already discovered door. And two of them add more premonitions, so you may end up going through up to seven of them instead of just the four you draw in the beginning. To help you out against those long odds, the four Happy Dreams are added to your deck. When you draw one of them, you may discard one of the Premonitions, search the deck for a specific card or rearrange the top seven cards, discarding as many of them as you like. This variant is more tense than the first two and needs a bit of planning to succeed: your choice of doors lets you trigger the Premonitions at the least unfortunate moment. Finally, there is my favourite expansion: The Book of Steps Lost and Found. Again, the game is first made tougher for you, but then you receive new tools to deal with it. Making the game tougher this time is a prescribed order to find the doors. Making the job easier is the ultimate all-purpose tool you can have in dreamland: magic. You have three different spells at your disposal that you activate by removing cards from the discard pile. So you need to create some fuel for the magic first, but then it’s powerful: for five cards, you may look at the bottom five cards of the deck and put one on top, for seven you can rearrange the order in which you have to find the doors and ten cards let you defend against a nightmare without any further ill effect. This is my favourite variant because it gives you the most options: you have more incentive to discard cards since the discard pile fuels your magic, but discarding too many will still make you run out of cards. And while the spells are powerful, you cannot use them all that often and choosing the right time is essential. As mentioned above, Onirim can be played by two players cooperatively. Very little actually changes about the game, just two things: both players now have to find four doors, one of each colour, and they share two cards of their hand. What do I mean by share? Each player has three cards to himself, two more are on the table between them that both may use. When a player discards a card, he may also exchange one card from his hand with the common hand to help his partner. For experienced coop players, this variant is slightly easier than the solo game, good communication is key. Basic Onirim is, frankly, not a very exciting game, ruled by luck and presenting you only with the very simple decision which colour to pursue next. But with either Dark Premonitions or Book of Steps Lost and Found it’s much more tense and exciting. Adding both together makes the game even more tense, but it does introduce a considerable amount of luck again because you lose some control over when the premonitions are triggered. Playing solo, Onirim has one of the most important qualities in a solo game, at least to me: it fits on an economy class plane table, although slightly cramped. With two players, it needs a bit more space – but you’d have two tables as well, so it still works – and while it doesn’t have quite the same staying power as a Pandemic or Forbidden Island it’s much easier to transport and take on your vacation. Are you one of those people that throw down their cards in anger when they lose a game? Well, in this one you throw down your cards OR you lose the game.